"Who Else Wants To Crank Out Profit-Pulling Letters And See Their Conversion Rates Shoot Through The Roof Like A Rocket... Starting Today!" Become Your Own Instant Expert At Writing Master Pieces That Sell... And Convert Twice Or Triple As Many Customers! Direct Response Sales Copies are FAR from dead, contrary to what many people might have you believed. You see, back in the 1960's many people speculated that magazines and newsletters will phase out when the television was newly introduced. Hey, we're in the 2000's now and what do you think? Do people still read magazines? YEP. Is Direct Response Marketing a thriving business? MORE THAN EVER. On the other hand, how many people walk off and buy something after watching an ad on TV now? NOT OFTEN. "This Is The Reason Why Top Gun Copywriters Are Paid Big Bucks..."
Chances are, you're one of them. And if you are selling anything online - and I mean ANYTHING - having a sales copy or not is like LIFE and DEATH for your business. "But What If I Tell You That..."
You can actually become a pro copywriter as well? "Introducing The Step-By-Step Videos To Becoming An Online Copywriting Pro..."
Some say it's the long sales letter and some say short sales letter Whatever your preference, it all boils down tests and conversions. Which actually converts better from people who have done tests? We've taken the expert case studies of actual sales letters to show you why a certain sales letter type will help you not only convert well, but have future backend conversions. You'll also learn how to use links correctly on your sales page. The sales letter writing has been split up into three parts, for videos 5, 6, and 7. In this video, you'll learn about the top area, which is the first thing your prospect will see. There are different types of headlines, and you'll learn how to combine several of them to create an attractive and exciting headlines that hits on your prospects true needs and wants! The sub headline helps add to the headline, and you'll learn how to do just that. How should you address your prospect and start the introduction of your sales letter? Often, the introduction is the hard part, because you don't know how to start off with a bang. This video will show you methods that expert copywriters use to jump start your sales letter. Now, we've gotten into the middle area of your sales letter It's time to announce the solution to your prospect's problems, which is your product or service. But then your customers will begin to ask questions such as, "How does your product or service Benefit me?". You'll learn the importance of using all these three items, and how to go about actually listing your benefits and some of the most common benefits that will strike your prospect's wants and needs. Most of these items are located at the bottom of your sales letter with exception of some testimonials and proofs. The nice things about these items are they help increase your conversion rates of your sales letter Think about it. If you came to a sales letter and there were many true testimonials on the page with people that were saying good things about a product and they had the same needs as you... wouldn't you become interested? Of course you would. You will learn how to use these items and apply them to your own sales copy so that you can increase your conversions. "It's Like Looking Over The Shoulders Of An Expert Top Gun Copywriter At Work!" Forget E-Books that just show you theories or 'what it might be like'. When you learn to write your first money-raking copy, I will be walking you through the steps - leaving no stones un-turned. "So How Much Does It Cost?" "Your Investment Is Fully Backed By My 100% Satisfaction Iron-Clad Guarantee..."
Okay here's the deal: purchase my "Online Copywriting Pro" videos now and check it out for a FULL 90 DAYS. Don't think. Don't wonder. Just try it out. It's now or never. The choice is clear. Order now! P.S. 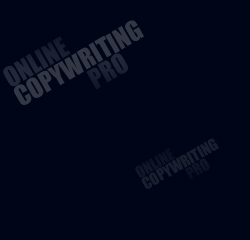 Finally, you can now save thousands from hiring your own top gun copywriter! P.P.S. Instead, I will show you HOW to churn out your own profit-raking sales letters in just hours instead of days or even weeks! P.P.P.S. In my videos, I show you every single step to crafting your own sales master piece, formula to making sales, and techniques to increase your conversion rates. P.P.P.P.S. Secure access to my private collection of videos now before you leave this page. You are protected by my No-B.S. 90 Day Money-Back Guarantee so there is no way you can lose.